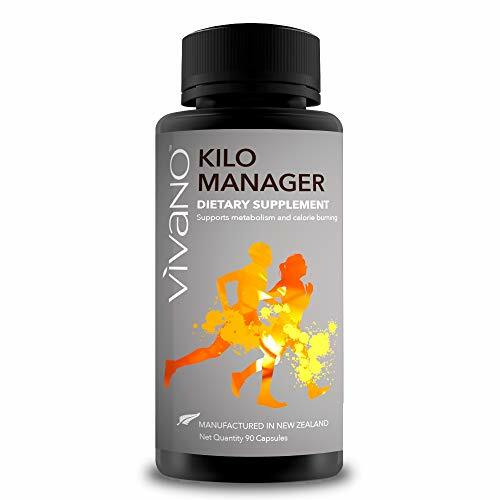 Premium Weight Loss Supplement - 100% Pure, Vivano Kilo Manager – Natural Fat & Calorie Burner and Metabolism Booster. with New Zealand kelp, Green Tea and Green Coffee Beans. BOOST METABOLISM, BURN FAT & LOOSE WEIGHT Promotes healthy burning of calories and fat absorption and reduces binge or impulse eating. Promotes antioxidants which work to counteract the damaging effects of free radicals. NATURAL YET POTENT HERBAL FORMULA - 3 herbs: New Zealand kelp, provides iodine for thyroid function whilst enhancing your energy, particularly fat, so less is stored by the body. Green tea brimming with antioxidants and EGCG to help \"flush\" fat & boost metabolism to help you burn fat faster. Aids to inhibit fat cell development to keep weight off after it\'s shed. Green coffee beans to aid weight management and may positively affect how our bodies absorb and use carbohydrates. BACKED BY SCIENCE-BASED RESEARCH. Newscastle University study shows alginate in kelp reduces fat absorption by up to 75%. A 2008 study in the Journal of Nutrition shows green coffee bean extract is found to induce effective weight loss. Green tea extract rich in epigallocatechin gallate. According to a American Journal of Clinical Nutrition 2008 study EGCG increases fat burning by up to 33% within 2 hours & can increase the body\'s rate of burning visceral fat cells per a 1999 study. FROM HERBAL IGNITE the #1 MARKET LEADER FOR 20 YEARS in New Zealand in its core 100% natural health supplements. MADE IN NEW ZEALAND in cutting edge FDA Registered manufacturing facilities, made to the highest standards with thorough testing and quality control. We guarantee no adulteration or undeclared ingredients. Rest assured you are only receiving premium quality, genuine and all-natural ingredients. WHY CHOOSE VIVANO KILO MANAGER? Ingredients are 100% natural, preservative free, sugar free, milk free, starch free, wheat free, yeast derivative free, gluten free and dairy free. It supports calorie burning, fat absorption and inhibits impulse eating making you happier with how your body looks and feels. Vivano Kilo Manager is DOUBLY EFFECTIVE when combined with Vivano Appetite Manager & works best in conjunction with healthy diet and exercise.